Always on the lookout for something good to eat in a pinch, the other day I picked up a couple of packages Patel’s Cuisine meals. First up today was Aloo Mutter — a spicy bowl of potato and green peas in a red curry sauce. Two minutes in the microwave and it was ready to go — hot and spicy, spicy. Slightly TOO spicy, for my taste, but still with great flavor. I just wish I had some jasmine rice to pour it over. Besides the obvious drawback of the pile of sodium that always accompanies these types of meals, this is one of the best like it that I’ve had. All natural, no preservatives, only a handful of ingredients and, of course, vegetarian. New recipe time! It’s been a long time, I know. I’ve got a backlog of things I’ve made in the last few months. The pictures are taken, the food is eaten. I just have to find the time to share them! I was in a hurry though, and when I get in these moods, I like to try something new. With my keys and purse already in hand, I grabbed a few back issues from my pile of Vegetarian Times stacked next to my cookbooks and started flipping through. I wasn’t sure what I was looking for — few ingredients, easy and fast — since it would be late by the time I got back from dropping off the meal to Chris and Jess and my chief taste-tester, Dan, would be famished. 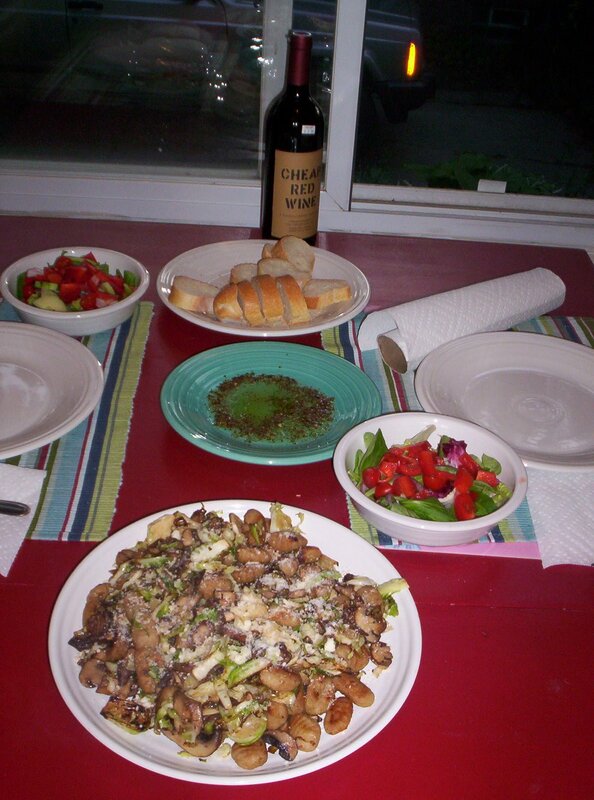 Although it was the picture of the Artichoke and Green Olive Souffle that caught my attention on page 32 of the February 2009 issue, I scanned down the page to find a recipe for Crispy Gnocchi with Brussels Sprouts and Mushrooms. 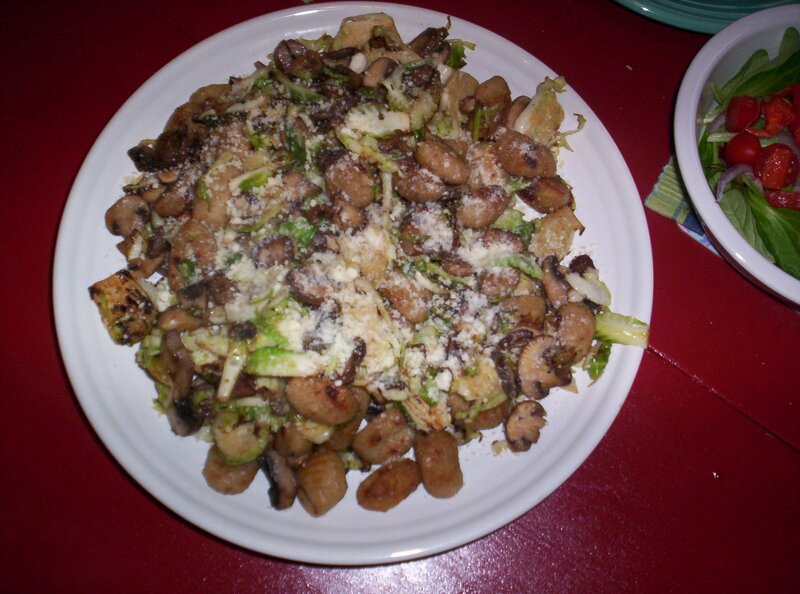 I had no clue whether Dan liked Brussels sprouts or gnocchi, but I decided I didn’t care and I would go for it anyway. Turns out, he didn’t know whether he liked either. And he didn’t know what he was about to eat. But the first bite brought out the best reaction I’ve ever gotten from any food I’ve ever made. Ever. 1. Heat butter in nonstick skillet over medium-high heat. 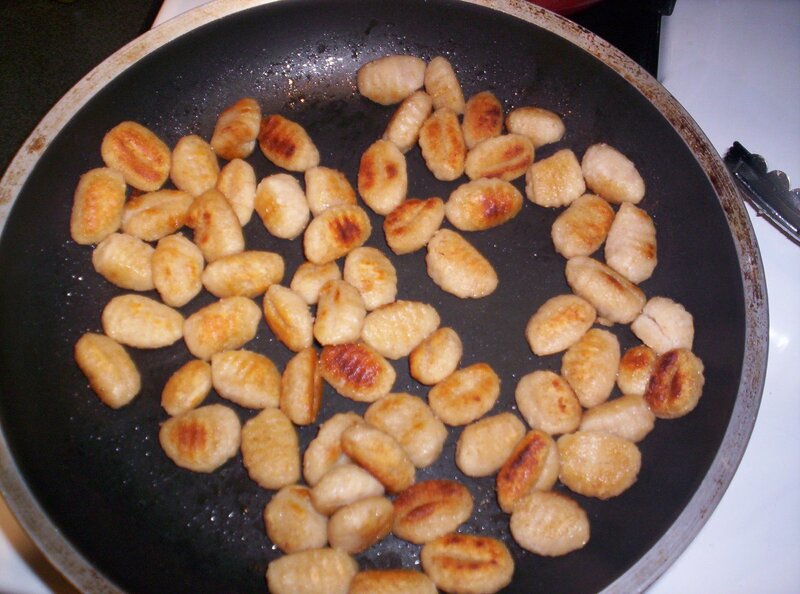 Add gnocchi and cook 4 to 5 minutes, turning often, until both sides are browned. Transfer to a large bowl. 2. Pour 1 tsp. oil into pan and add mushrooms. Cook 7 minutes or until mushrooms have cooked down and all liquid is cooked off. Season with salt and pepper, if desired, and transfer to bowl with gnocchi. 3. 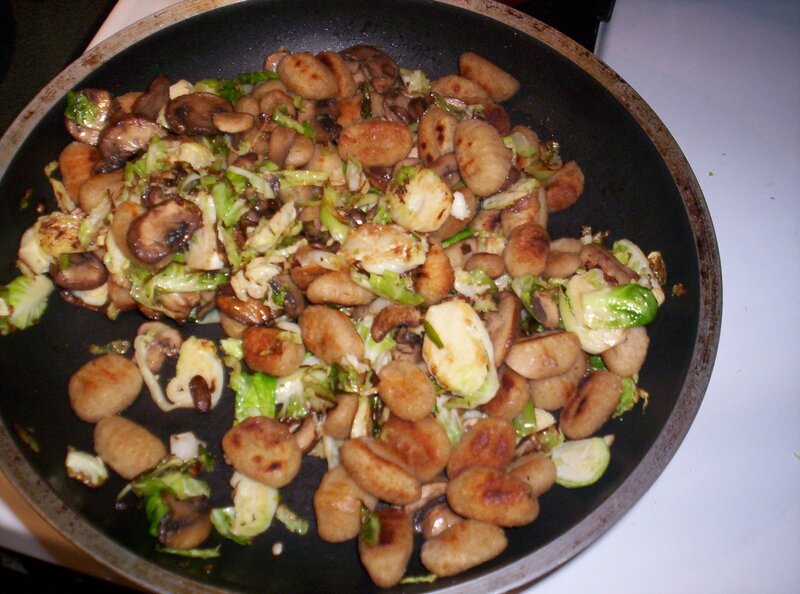 Pour remaining oil into pan and add Brussels sprouts. Saute 5 to 7 minutes, until crisp-tender. Add garlic and cook 1 more minute. Return mushrooms and gnocchi to pan and saute a couple of more minutes to heat through. 4. Transfer to plates or a platter and garnish with cheese. Enjoy!